It was Breakfast Club today! I was almost giddy. Here's what I accomplished...which is amazing because I felt like I spent most of the time eating, talking and shopping! I will share "Show and Tell" soon. I was just sure you wanted to see how Jenny and Tonka are liking the new house. Smiles all around. They have a way of making every room look smaller when they are in it. On this Memorial Day I feel so fortunate to live at this time in history. I am a military brat. My mom was in the Navy where she met my dad. My dad is a retired Marine who served two tours in Vietnam. I'm so grateful he made it home both times. The military always has been...and I suppose always will be a part of my life. I served four years in the Air Force. That's where I met my husband, a fighter pilot for the Texas Air National Guard. My sons both plan to join the service when they are through with college. I am so grateful to those who have served our country and to those who serve it in the future. In my quilting world I am struggling with the decision of fabric for Dresdan Plate centers. Think I'm going with the dark centers. I'm so grateful these are the toughest decisions I have to make today. I've been catching up on needlework. Meet "Canterbury Santa." He's one of three in a set of Medieval Santa ornaments. I enjoyed making this piece...lots of beading. Thought I'd share my Needlework Diary. Years ago, I bought one of those cheapie blank books from Michael's for a dollar. Wrote "Needlework," in my best crafty handwriting. Since I collect Santa ornament kits from Sandra Cozzolino, this helps me keep track of what kits I already own. I also have the satisfaction of marking them completed in my diary. So far I have made...43 Sandra Cozzolino Santa ornaments. I have 63 more kits...WOW! I had no idea. I better get out the next kit and get started! Just to make me feel a little better I have also finished 58 other cross stitch kits...mostly ornaments. I also keep track of my completed Bucilla stockings and ornaments. I have made 31 Bucilla felt stockings and 32 Bucilla felt ornaments. I cannot divulge the number of those kits I have stashed...triple digits required. It's cheaper than collecting shoes or jewelry. And I do show some restraint...there's a series of kits from Mill Hill with holiday village buildings...adorable. I haven't bought one of those...not going to get started on that group. I was working at the new house today...cleaning. Since no contractors will be there for three days it's a good time to try and get the house clean for our move in the first week of June. While washing windows this creature walked by. I saw her yesterday too...so I guess this is her space. Behind the porch post is the body of a second moose...I think it was her calf from last year. I've seen these two fairly often at the house site...expect to see more pictures of them. Thought I'd share a photo of the latest look of our wood flooring since I applied the tung oil 11 days ago. It is reclaimed wood from a barn in New York. Now it's a floor for a house in Alaska! The floor got the Bernese Mountain Dog seal of approval today. The dogs got to walk on it for the first time since I oiled it and my male, Tonka, dug his nails in while rough housing...not a mark on the floor at all! The only progress on the new house today was I finally hung the mirror in the powder room...it's only been sitting on the floor for 2 months. I did buy some glass knobs for the cabinet...and I almost installed them...but my personal drill is hidden in my sewing room at the current house so I need to take that next time. I don't have man hands so I get tired of trying to use tools made for men. And there was a typo on the Breakfast Club schedule..it's not until next Thursday...which is the last Thursday of the month. It's just as well...I needed to spend time on the phone today trying to schedule people to finish working on our new house. We are so close to being done...we are certainly ready to start moving. There is so much to do lately but it is almost the last Thursday of the month when I meet with kindred spirits...Breakfast Club! I just don't think I should miss it. Selling houses and building houses can wait one day. This month we are doing a freebie internet pattern from Anthology Fabrics. It's an interesting pattern that uses a set of 40, 2 1/2" strips and 40 layer cakes. I was very tempted to order new fabric (there are some really nice Tonga Treat batik strip and layer cake sets I really like but don't have) but I really have more than enough of these gems sitting in my sewing room already. So I pulled a set of Hoffman Bali Pops and noticed a set of layer cakes from Connecting Threads...looks like they will work very well together. Progress has been made on Sweet Peas in the Meadow. Terrible photo...can't wait to finish it and get a photo with day light. I'm just waiting on some fabric to arrive for a small final border of dark purple. 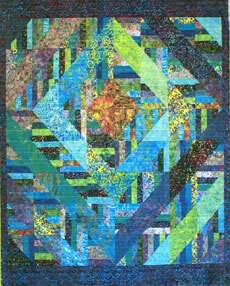 On the top right side of my blog I have added a "Free Quilt Pattern" page. You can now download the pattern for Batiki Argyle. I feel very close to living in the age of the Jetsons. I can't believe how easy it was to make this pattern available to everyone...wow. Just hope I didn't make any big mistakes! On the home front...we have a contract to sell our current home! I'm very nervous about celebrating too early...the timing just seems too perfect. Our new home should be ready in a couple of weeks. ...a preponderance of of four-patches left over. And I did notice the final size of the quilt was just 10 inches shy all the way around of being the perfect size for my bed. Hhhmmmm. Time to open up EQ7. Love this! Now it will be the perfect size. And after counting the four-patches there will be 10 leftover. I have enough green batik to do the final border...not enough of the purple I used on the inner border. Still nagging at me. So I changed the green to purple in EQ7. I like the purple better. Not sure I can find anymore of it but I will be checking that out later today. Meanwhile, I sewed the next border on and Sweet Pea is waiting for some more attention. The baby birds are ready to spread their wings...my son, Zachary, is in the middle with his girlfriend, Lindsey and buddy, Taylor. The memory that came to me during the graduation ceremony was Zack as a toddler, running with a push toy. He crashed into a rear light of my Honda as it was parked in the driveway. Broke the light but not his head! Batiki Argyle is officially a completed flimsy. All of the dark batiks started as 5" charm squares. I am working on a pattern for it and will post it on my blog soon. I really don't have much time for sewing lately but this project is easy and is something I can work on a little at a time. It's a great stress reliever and gives me a feeling of accomplishment. The outer most set of squares needs to be attached but it's all fitting together without any seam ripper action or additional sewing to adjust...my math came out right! I think I will add a small border of the background fabric and then finish with a fun print that has all of these colors...but I could change my mind. Here's an update on the new house. Hubby got the wood floors sanded this weekend and I spent almost as much time vacuuming up the sawdust. We are going to use tung oil to finish them...very rustic look. No one in Alaska carries the tung oil we want to use so we are waiting for Fed Ex to deliver it in a couple of days. Can't wait to show the "after" photo! We have another showing of our current home today...cross your fingers we get an offer soon. It's been busy. We've been working on "finishing" the wood floors in the new house and keeping the current house ready for showing prospective buyers. Two showings this week. I have been sneaking in time to work on the borders of Batiki Argyle. I went mirror shopping last week for the new house and somehow wound up at a quilt store. I think I stumbled upon a great fabric to use for the outermost border on the bottom of the photo. The light batik is the darker of my backgrounds in the quilt. I also came home with a great mirror for the new house that was a fabulous price...I'll show that some day when I get it hung...maybe next week. I want to paint the bathroom a different color before I hang the mirror. Not even moved in and I'm changing wall colors! I got the center of Batiki Argyle put together. This went so quickly. Now to tackle borders...I'm still playing with the actual make up of those on EQ. My Batiki Argyle quilt is coming together pretty quickly. I have half of the rows sewn together.